Studies have shown that an average engagement ring would cost you around $4,758, which is not a trivial amount. The amount that an engagement ring would cost you depends on a number of factors, such as the annual income of the person purchasing the ring, the kind of ring they are looking for, and the budget they have allotted to the purchase. Most people are of the belief that engagement rings should be purchased with a generous budget. Very few people find it appropriate for an engagement ring to cost less than $1,000. It is seen that the most popular range for engagement rings is between $1,000 and $3,000. People who opt for an engagement ring worth more than $5,000 are those who think that money is not a barrier and have an extravagant budget. 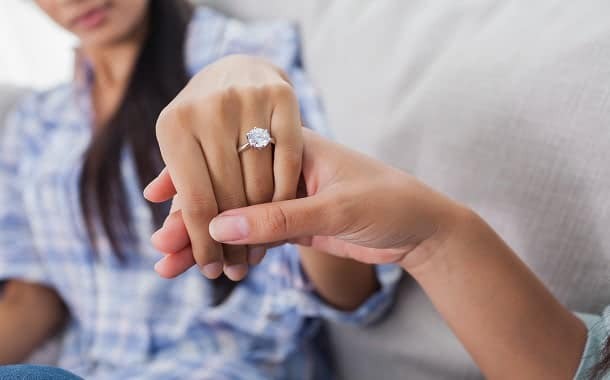 Some people have indeed increased the upper limit for the range of engagement ring budget with more and more people opting for a ring worth more than $5,978. This is because women usually love to flaunt the ring and prefer rings which are on the expensive side. Different rules can be followed to ensure that you opt for an engagement ring that would be appropriate. Planning ahead would save you from quite a bit of trouble. According to a report, the purchase should dedicate three months of salary to the ring. However, in case the person is going through any financial crisis or is apprehensive about his job security, this is not the rule to abide to. Another tactic you can use is to spend a month’s salary on the ring, which would prove to be an economical option. If a one month’s salary seems a little too little and the three-month salary seems a bit too much for an engagement ring, two months’ salary can also prove to be a good option as this will ensure that you get a good ring and do not have to face a financial crisis for it. Another option that you have is to spend only the average cost of the engagement ring, which is around $4,000. At the end of the day, the amount that a engagement ring would cost depends on you entirely. You can seek input from friends and family and get information about the average budget most people set for this purpose, but at the end of the day, it would come down to how much you are willing to spend. The kind of person your future wife is would also influence your decision. Many women do not like the idea of putting in too much money into an engagement ring, while others prefer a ring that breaks all barriers. Therefore, while setting a budget for the engagement ring, you should ensure that the decision is personal and has been taken after paying heed to all the relevant factors. You are unlikely to face any trouble in finding a engagement ring within your budget. For instance, if you are looking for an economical option that would not break the bank, Bony Levy Bridal Pave Diamond Basket Semi Mount Ring is a good option, which would cost you around $2,995. If you are looking for something more expensive and extravagant, Auriya Diamond Double Halo Ring might prove to be a good choice, which costs around $5,396. If someone is looking to go all out, a ring worth $19,500 such as the Forevermark White Gold Center of My Universe Solitaire Diamond Ring is an option. Should the average working Joe buy an expensive engagement ring? The engagement day is not a small occasion, and you should purchase a ring that would be suitable and would not fail to bring a smile on the face of your significant other. Being economical is good, but you should also make sure that you don’t adopt a miserly approach to the task. Adequate research regarding the options you have can prove to be beneficial. How Much Does Savannah Cat Cost How Much Does WP Engine Hosting Cost?